For other uses, see Chilliwack (disambiguation). "The Green Heart of the Province"
Chilliwack /ˈtʃɪləwæk/ is the 7th largest agglomeration in British Columbia, Canada. Historically an agricultural community, most of its 83,788 residents are now city-dwellers. Chilliwack is the seat of the Fraser Valley Regional District and its second largest city. This city is surrounded by mountains and recreational areas such as Cultus Lake and Chilliwack Lake Provincial Parks. It is located 102 kilometres (63 miles) southeast of Vancouver. There are many outdoor activities in the area, including hiking, horseback riding, archery, biking, camping, fishing, and golf. In Halq'eméylem, the language of the Stó:lō communities around Chilliwack and Sardis, Tcil'Qe'uk means "valley of many streams". It also lends its name to the Chilliwack River, and group of aboriginal people, the Ts'elxweyeqw. The spelling of Chilliwack is sometimes a matter of confusion. Prior to the amalgamation of the City of Chilliwack and the Municipality of Chilliwhack, there were two different spellings. When amalgamated, the current spelling of the city was adopted. Anglicized spellings include "Chilliwhyeuk" and other versions closer to the original Halq'eméylem. The archeological record shows evidence of Stó:lō people in the Fraser Valley, or S'ólh Téméxw, 10,000 years ago. Permanent structures in the Chilliwack area date from around 5,000 years ago. It is estimated that at the time of the first contact with Europeans, there were as many as 40,000 people living within Stó:lō territory. By 1859, over 40,000 gold miners had trekked to the goldfields, most travelling through the Chilliwack area. By the mid-1860s, several farms had grown up around the steamboat landings on the Fraser River called Miller's Landing, Minto Landing, Sumas Landing and Chilliwack Landing. The Township of Chilliwack was incorporated in 1873, the third municipality in British Columbia. The initial settlement was along the Fraser River at Chilliwack Landing. Steamboats were the main mode of transportation, carrying goods and passengers between Chilliwack and New Westminster. After the construction of the Canadian Pacific Railway in 1885, many residents began to cross the Fraser River at Minto Landing to catch the train at Harrison Mills. With little room for expansion along the river, the commercial area of the town moved south to the junction of the New Westminster-Yale Wagon Road, Wellington Avenue and Young Road, called "Five Corners". A large subdivision called Centreville was built in 1881. The name "Centreville" was replaced In 1887 by the more popular "Chilliwack." The area was incorporated in 1908 as a separate municipality, the City of Chilliwack. The city and the township co-existed for 72 years. In 1980, they merged to form the District of Chilliwack. The District of Chilliwack became the City of Chilliwack in early 1999. 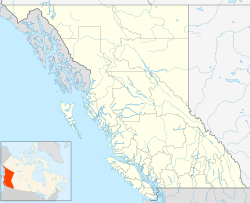 Chilliwack is located in the Upper Fraser Valley, 100 kilometres (60 mi) east of Vancouver on the Trans-Canada Highway. The city is bounded on the north by the Fraser River, and on the south by the Canada-United States border. Chilliwack is surrounded by tall mountain peaks, such as Mount Cheam and Slesse Mountain, and large rivers (the Fraser and Vedder). The Chilliwack Batholith is a large batholith that forms much of the North Cascades in southwestern British Columbia, Canada and the U.S. state of Washington. The geological structure is primarily named after the City of Chilliwack, where it is the most notable geological feature. The Chilliwack Batholith is part of the Pemberton Volcanic Belt and is the largest mass of exposed intrusive rock in the Cascade Volcanic Arc. The age of the Chilliwack batholith ranges from 26 to 29 million years old. In 2013, Maclean's reported that, with an average annual temperature of 10.5 °C, Chilliwack is the warmest city in Canada. The city is made up of several amalgamated villages and communities. The urban core has a decidedly north-south axis bisected by the Trans-Canada Highway. The city is bounded in the north by the Fraser River, in the east by the Eastern Hillsides, in the south by the Canada–US border, and in the west by the Vedder Canal. With 939 farms on approximately 17,322 hectares (42,800 acres) of dedicated farmland, farming is essential to the city's identity. Also referred to as "Chilliwack Proper Village West", the north side covers the area from the Trans-Canada Highway in the south, to the Fraser River in the north, and includes the communities of Camp River, Chilliwack Mountain, Downtown Chilliwack, East Chilliwack, Fairfield Island, Rosedale and Popkum. Downtown Chilliwack is the historical urban centre of the city. 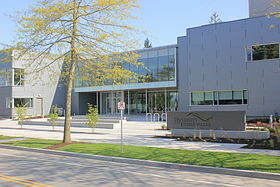 Several cultural attractions, such as the Prospera Centre, Chilliwack Cultural Centre and the Eagle Landing Shopping Centre are located there, as well as key government buildings, such as city hall, FVRD offices, and the Provincial Court of British Columbia. The south side includes the communities of Atchelitz, Cultus Lake Park, Greendale, Ryder Lake, Sardis, Promontory Heights, Vedder Crossing, and Yarrow. Sardis is the urban core of the south side and is a popular shopping destination. Chilliwack is known for its locally-grown corn. From June until September the farmers take advantage of the sunny weather and produce up to two crops of corn for both human consumption as well as for cattle feed. The Book Man used bookstore is the second-largest in the Province of British Columbia. Chilliwack has an active rock music scene, centring mostly around young ska and punk rock bands. Bands originating in Chilliwack include: These Kids Wear Crowns, Mystery Machine, and The Darkest of the Hillside Thickets. Chilliwack also has a thriving classical music community, featuring the Chilliwack Symphony Orchestra and the Chilliwack Metropolitan Orchestra. The drumline from Sardis Secondary School played at several venues during the 2010 Winter Olympics in Vancouver. Chilliwack also offers many other community events and classes throughout the year. The Downtown Chilliwack Business Improvement Association hosts free concerts and activities in the downtown core each Friday evening during the months of July and August, called "Party in the Park". "Music and More" is another free summer event that takes place each Wednesday throughout July and August, with kids' activities at noon and concerts in the evening. This event is presented by numerous local arts groups working together, and the Chilliwack Community Arts Council. Another annual event that is a corn maze, where the public is invited to roam in the farmers' fields when the crops of corn are at their highest. Despite their name, the band Chilliwack actually formed and is based, in nearby Vancouver. The Chilliwack Cultural Centre is a performing arts venue located in downtown Chilliwack. The building is home to the Chilliwack Players' Guild (the resident theatre company), as well as the Chilliwack Academy of Music. The UFV Theatre is a 206-seat thrust stage venue belonging to the University of the Fraser Valley (UFV) Theatre Department. UFV produces three or four mainstage shows each year, as well as the annual Directors' Festival featuring student directors and performers from UFV, Capilano University, Thompson Rivers University, University of Victoria, UBC and Douglas College. The Chilliwack School of Performing Arts provides pre-professional training in acting, singing and dancing to children ages 3–18 at the North Campus of the University of the Fraser Valley. The mainstage show performs a two-week run every January at the Chilliwack Cultural Centre, and a Spring Festival featuring performances from many age groups at the UFV Theatre in late May. Programs at the Chilliwack Performing Arts can be registered for at. Many different programs are available, including a Junior Musical Theatre and Summer Break Camps. Chilliwack Museum and Archives, located in the 1912 former city hall on Spadina Avenue, is a National Historic Site of Canada. The Chilliwack Museum and Archives are a non-profit organization operated by the Chilliwack Museum and Historical Society which began in 1958 by brothers Oliver and Casey Wells. See also: Category:People from Chilliwack. Betty Fox, cancer research activist, mother of Terry Fox. Tony Clarke, activist, who graduated from Chilliwack Senior Secondary. Patrick Gallagher, actor from Glee, True Blood and Night At The Museum. Graduated from Chilliwack Senior Secondary. Tasha Tilberg, Covergirl model. Born in Chilliwack on July 23, 1979. Appeared on the covers of magazines such as Vogue, Harper's Bazaar and Marie Claire. Dave Archibald, a former professional hockey player with the Minnesota North Stars and Ottawa Senators. Rick Klassen, former professional football player with the BC Lions and Saskatchewan Roughriders. Amber Allen, a former professional soccer player with the Vancouver Whitecaps. 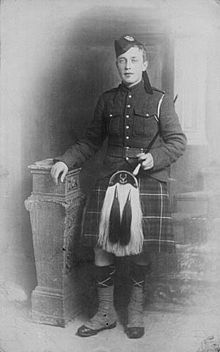 Jack McGaw, journalist and radio operator. Diana Swain, television journalist. Graduated from Chilliwack High School in 1983. 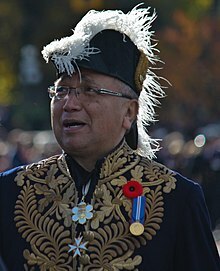 Steven Point, OBC, first aboriginal Lieutenant-Governor of British Columbia. Allan Fotheringham, columnist. Worked for The Chilliwack Progress as a student. W.P. Kinsella, OC OBC, author of Shoeless Joe, lived in Chilliwack. Chilliwack Times published its final edition on December 28, 2016. See also: Category:Sport in Chilliwack. The British Columbia Hockey League's Chilliwack Chiefs, play at Prospera Centre. The team used to be the Quesnel Millionaires. The franchise was purchased and moved to Chilliwack by the Chiefs Development group. They started in the BCHL's Interior Conference for the 2011/2012 BCHL Season. While the original Junior "A" team, the Chilliwack Chiefs, plays in Langley, British Columbia, as the Langley Rivermen (the Chiefs Development Group sold their interest in the Langley Chiefs but retained the 'Chiefs' name and history). The Western Hockey League's Chilliwack Bruins used to play at the Prospera Centre. The expansion franchise began to play in 2006 and ended when the team was sold at the end of the 2011 season. It became the Victoria Royals WHL hockey team in 2011. Community sports include hockey, lacrosse, softball, soccer, football, baseball, field hockey and swimming. The Canadian Junior Football League's Chilliwack Huskers play at Exhibition Stadium. Chilliwack Turbo Fastball club won the 1997 Canadian Jr. Men's National Championships. In 2013 the team was an inaugural induction into the Chilliwack Sports Hall of Fame. Chilliwack's minor baseball Cougars were the 2006 Western Canadian tier 2 champions. Chilliwack hosted the 2007-2008 Synchronized Skating Canadian Championships at the Prospera Centre. Chilliwack Minor Hockey Association was organized in 1958 with the opening of the Chilliwack Coliseum. The climate is typical oceanic (Köppen: Cfb) but with some influence of the land mass being some distance from the sea, similar to Orléans, France (although the former has a precipitation more than twice as long and with a tendency towards the Mediterranean pattern). Chilliwack's mild climate with limited extremes provides excellent growing conditions for a wide variety of crops and agricultural products. In fact, when averaged from 1981 to 2010, Chilliwack had the warmest mean temperature for any city in Canada. According to the weather network, The latest recorded snowfall was on April 19 2009. And the earliest was on Sept 28th, 1938. The highest temperature recorded in Chilliwack was 39.4 °C (102.9 °F) on Aug 10, 1898. The lowest recorded temperature was −26.7 °C (−16.1 °F) on Jan 31, 1929. Precipitation falls mostly as rain, with snow limited to the surrounding mountains, except for two or three weeks per year generally in December or January. The latest recorded snowfall was on April 19 2009. And the earliest was on Sept 28th, 1938. In 2013, Maclean's reported that with an average annual temperature of 10.5 °C, Chilliwack is the warmest city in Canada. Chilliwack receives nearly the same number of days of precipitation (184.6 days at greater than 0.2 mm) as comparable local communities nearer Vancouver such as Maple Ridge (185.8 days) and the City of Mission (186.0 days) (Environment Canada Statistics). Summers in Chilliwack are usually sunny and warm, with long days (light out until well after 10 pm in June with dusk that lasts for hours) and with occasional stretches of heat where temperatures rise above 30 °C (86 °F). Due to its location at the eastern end of the Fraser Valley, there has been some debate about preserving Chilliwack's air quality. However, the 2011 World Health Organization's study of air quality shows that Chilliwack enjoys air quality among the best in the world. For PM10 (10 µm) size particulates, Canada averaged third best in the world (along with Australia) at an average of 13 micrograms per cubic metre. The City of Chilliwack and the Greater Vancouver Regional District were tied at a low 8.0 MPCM. For smaller particulate of 2.5 µm size (PM2.5), "the City of Chilliwack averaged 4.9 micrograms per cubic metre. Vancouver also had 4.9, Calgary had 5.6, Winnipeg had 5.6, Toronto had 7.9, Montreal had 11.2 and Sarnia had 12.7." Density: 320.2 people per km². Chilliwack is part of the Lower Mainland-Southwest economic region. Chilliwack's service and retail sectors account for approximately 50% of GDP. Other growing industries include manufacturing accounting for 13%, construction at 8% and agriculture and forestry at 5% of Chilliwack's GDP. CFB Chilliwack was established in 1941 as Camp Chilliwack following Canada's entry into the Second World War in 1939. After the outbreak of the Pacific War the camp was expanded to garrison Canadian Army units for the defence of Canada's West Coast. The base was also a training facility: 112 Canadian Army Basic Training Centre and A6 Canadian Engineering Training Centre were housed at Chilliwack until the war's end in 1945. During the Cold War, the base was used as a permanent training facility and the garrison for the Canadian Army units of British Columbia. The base housed the Royal Canadian School of Military Engineering, formerly A6 Canadian Engineering Training Centre and 58 Field Engineer Squadron which was transferred from CFB Esquimalt on Vancouver Island. In 1994, the Princess Patricia's Canadian Light Infantry 3rd Battalion (3PPCLI) was transferred from CFB Esquimalt to CFB Chilliwack, the last unit to be transferred to the base. Due to Department of National Defence cutbacks at the end of the Cold War, the base was closed in 1997. CFOCS was transferred to Area Support Unit St-Jean in Quebec (ASU St-Jean), CFSME transferred to CFB Gagetown, 3PPCLI and 1CER were transferred to CFB Edmonton. Part of CFB Chilliwack became a residential subdivision known as Garrison Crossing, and its training facilities became the Canada Education Park, a campus for a number of post-secondary schools. The Chilcotin Training Area, better known as Area C, is still operational and is part of the Western Area Training Centre (WATC). Area C is used by the Primary Reserves units of British Columbia for field training and for the use of its firing ranges. The ASU is also used by Cadets for field training. The ASU also houses supply depots for the Canadian Army units of 39 Canadian Brigade Group and the cadet units of BC. The old quartermaster warehouse is now the Canadian Military Education Centre Museum. Vancouver International Airport is located about 113 km (70 mi) from downtown Chilliwack and has non-stop flights daily to Asia, Europe, Oceania, the United States, and Mexico, and other airports within Canada. Abbotsford International Airport is located about 42 km (26 mi) west of Downtown Chilliwack and offers scheduled service to Calgary, Edmonton, Toronto and Victoria, where passengers can connect to anywhere. Chilliwack Airport is a small regional airport located in Downtown Chilliwack. It has 1,219 m (3,999 ft) of paved and lit runway that includes a parallel taxiway. Approximately 70% of the estimated 60,000 annual air traffic movements are itinerant traffic that consists of both pilot training and recreational flights from all around BC and south of the border. There are about 175 km (109 mi) of bike lanes throughout the city with additional lanes being added every year. A four-lane to six-lane expressway from Horseshoe Bay to Hope runs through Chilliwack on the Lower Mainland section of the Trans-Canada Highway. The Agassiz-Rosedale Highway is a north-south route in the eastern part of Chilliwack that acts as the last connection between Highways 1 and 7 eastbound before Hope, and is the main access to the resort village of Harrison Hot Springs. The highway first opened in 1953, originally going between Yale Road in Rosedale and Highway 7, with a ferry across the Fraser River. A bridge replaced the ferry in 1956. When the section of Highway 1 east of Chilliwack opened in 1961, Highway 9 was extended south to a junction with the new Highway 1 alignment, which replaced Yale Road as the main route between Chilliwack and Hope. Chilliwack Transit System consists of a fleet of 9 buses that operate along regularly scheduled routes throughout the metropolitan area. Chilliwack Railway Station consists solely of a signpost and paved low-level platform located on the north side of the CN Railway tracks at Nowell Street. The station is served by Via Rail's The Canadian three times per week (two in winter) as a flag stop (48 hours advance notice required). The station is only served by the westbound train to Abbotsford and Vancouver. Eastbound trains call at the Agassiz railway station located on the north side of the Fraser River on the CP Railway tracks. The reason for the splitting of service is that between Abbotsford and Kamloops, CN and CP use each other's tracks for directional running through the Fraser Canyon on long stretches of single track. Canada Education Park (CEP) is a 86-acre (35 ha) campus in the Vedder Crossing neighbourhood on the south side of Chilliwack that houses several post-secondary institutions, including the University of the Fraser Valley, the RCMP Pacific Region Training Centre, and the Justice Institute of British Columbia. The University of the Fraser Valley (UFV) is the largest post-secondary school in Chilliwack, and the seventh largest in British Columbia in terms of full-time enrollment. It offers master's degrees, bachelor's degrees, associate degrees, diplomas, certificates and citations across a range of programs in fine arts, humanities, science, social sciences, applied communication, business, nursing, as well as technical and trade programs. Its campuses are located in Abbotsford, Chilliwack, Hope and Mission. The Conseil scolaire francophone de la Colombie-Britannique operates one Francophone school: école La Vérendrye primary school. 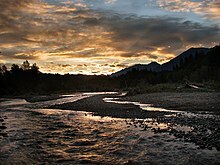 ^ "Chilliwack River". BC Geographical Names. ^ "History of Chilliwack". gov.chilliwack.bc.ca. City of Chilliwack. Retrieved 9 March 2014. ^ "Community of Villages". chilliwackmuseum.ca. Chilliwack Museum and Archives. Archived from the original on 2015-07-01. Retrieved 9 March 2014. ^ a b "Canada's Top 10 cities for weather - Macleans.ca". Macleans.ca. Retrieved 1 January 2019. ^ "Agriculture". Chilliwackeconomicpartners.com. Retrieved 9 March 2014. ^ "Directors' Theatre Festival". Ufv.ca. Archived from the original on 2014-03-03. Retrieved 3 March 2014. ^ "CSOPA Programs". Csopa.ca. Retrieved 1 January 2019. ^ a b "CMEC Museum". cmedcentre.ca. Chilliwack Military Educations Center Museum. Archived from the original on 2014-05-17. Retrieved 9 March 2014. ^ Chilliwack City Hall. Canadian Register of Historic Places. Retrieved 29 October 2011. ^ "Chilliwack Museum and Archives". chilliwackmuseum.ca. Chilliwack Museum and Historical Society. Retrieved 9 March 2014. ^ Lazaruk, Susan (2011-06-25). "'Moving, simple and beautiful' services held for Betty Fox, 73". Postmedia News. Windsor Star. Retrieved 2011-06-27. ^ "Chilliwack secondary grad from 1990 wins golden Grammy". Black Press. Chiliwack Progress. Retrieved 19 March 2017. ^ Books, L. L. C. (1 May 2010). "People from Chilliwack, British Columbi: Jim Vallance, W. P. Kinsella, Chuck Strahl, Dave Archibald, Keith Hunter Jesperson, Brett Sonne". General Books LLC. Retrieved 1 January 2019 – via Google Books. ^ "Chilliwack, British Columbia Köppen Climate Classification (Weatherbase)". Weatherbase. Retrieved 2019-02-23. ^ "Climatological Information for Besançon, France". Meteo France. 14 February 2019. ^ "Orléans (45)" (PDF). Fiche Climatologique: Statistiques 1981–2010 et records (in French). Meteo France. Retrieved 14 February 2019. ^ David Phillips (2010). "WeatherStats: Weather Winners". Environment Canada. ^ "Canadian Climate Normals 1981-2010 Station Data". Environment Canada. 26 May 2016. Retrieved May 26, 2016. ^ "Census Profile, 2016 Census Chilliwack, City [Census subdivision]". Statistics Canada. 24 April 2018. Retrieved 9 November 2018. ^ "Local economy". Chilliwackeconomicpartners.com. Retrieved 9 March 2014. ^ "Bike lanes". Chilliwack.com. Retrieved 9 March 2014. ^ "Chilliwack Train Station". viarail.ca. VIA Rail Canada. Retrieved 9 March 2014. 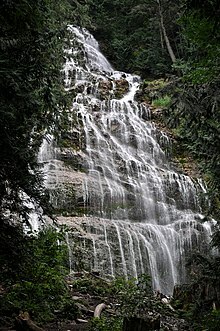 Wikivoyage has a travel guide for Chilliwack. Wikimedia Commons has media related to Chilliwack, British Columbia. This page was last edited on 22 April 2019, at 06:17 (UTC).